We'd always love to hear your thoughts.. Get in touch..
"Time and time again, I hear people say “I am not flexible enough to do yoga; there is absolutely NO WAY I could do this pose”. If that's you, read on !!! Our Core Yoga Course is just right for you. Yoga is not designed to create flexible rubber bands like the yogis on social media. The physical yoga practice - asana- is to prepare our body for meditation, and the side effects of this are improved mobility, strength, flexibility, and most important, body and mind awareness. That's right?! So if you are a brand new yogi wanting to try it out, or a seasoned yogi who would like to brush up on alignment and benefit from a slower practice, our Core Yoga Course is for you: step by step, we guide you through to our core and the best alignment for your body, in gentle, effective and playful ways. Classes our mini-workshops - always focus on an element of core stability which is an indispensable ingredient for the longevity of your practice. Over time you will build flexibility and strength in body and mind, and cultivate a positive outlook in your life! Wear your most comfortable gear, a curious attitude and an open heart, and join us!" Join Yogarama's Caroline Bakerman for Core Yoga Classes every 930am Tuesday at Wylies Baths in Coogee, nestled in nature by the ocean. Bringing Back Balance For Better on International Women’s day! As a mother of two, I trained to be a yoga & mindfulness teacher after a potentially life-threatening illness that was mostly caused by too much stress. After nurturing myself back to health and finding balance in my life through meditation and yoga, I started a journey to empower more people to bring back balance and health in their life. At Yogarama we are celebrating with special classes focused on the theme for this special day #balanceforbetter. We believe life is all about balance, both in creating a world that is gender-balanced as well as living a personal life of balance. Take a deeper dive into finding inner peace and balance this year and join us for a trip to India - info night in April 2019. Join the Yogarama team for a special $10 class on International Women’s Day - 9 am Friday to delve into the world of balance. The journey to health and wellness is an ongoing one - a lifetime of new learnings. A recent survey of our Yogarama community revealed that many of you are keen to learn about meditation. A regular yoga practice is one big step forward in managing your physical, mental and emotional health and regular meditation is the next big step for many of us. In my own journey, I began with a regular yoga practice and it was my shift toward a regular meditation practice that truly calmed my mind, grounded me in every aspect of my life leading to spiritual growth. Importantly meditation has truly helped me when I’ve been experiencing anxiety, sleep issues, and illness. Meditation is increasing in popularity much more as people discover its benefits. There are many forms of meditation from mindful meditation focused on the breath to transcendental meditation using repetitive mantras. Essentially meditation is a habitual process of training your mind to focus and redirect your thoughts. You can use it to increase awareness of yourself and your surroundings as well as to reduce stress and improve focus. A regular meditation practice can develop other beneficial habits and feelings, such as a positive mood and outlook, self-discipline, healthy sleep patterns and even increased pain tolerance. Yogarama will be holding a 4-Week Mindful Meditation Course in our beautiful shala space by the ocean in nature. Register your interest here. Our lives are always so busy. When we don't take time out for ourselves, we do get stressed. A toxic dose of that stress hormone, cortisol, can lead to chronic diseases like irritable bowel syndrome, insomnia or even cancer. Saying “no” on occasion is a powerful gift we can give ourselves so that we have the energy to focus on what matters most and is better for our health: like being with friends and family, or spending time with a good book. Here are three helpful tips to slow down and set boundaries so you can enjoy your life so much more. 1. Get comfortable with saying the word “No”—Nicely. It can feel awful to say no to help someone else but making yourself a priority is an act of self-compassion that can help prevent burnout— take time out to walk the dog, go to your favourite yoga class or soak in a bath. In the end, you will be more focused and engaged in the activities you commit to do. 2. Take time out to breathe – whether its 3 deep breaths, 3 minutes of quiet time or a 20-minute meditation session. There are enormous benefits of breathing more consciously. Invite a friend to yoga & meditation classes to reflect and set your intention for being more present and centred..
3. Finally, say “thank you”—and mean it. We give and receive—whether it’s a home cooked meal, a donation to charity, or simply a present. It's easy to end up in “gratitude autopilot,” going through the motions of thankfulness without truly appreciating what was gained. Try a mindful scan of the body just after every time your say “thanks” or “thank you”. Notice how you feel. Yogarama's yoga and mindful meditation classes explore filling up our hearts with self-compassion so we can give to others. The focus is on the breath (pranayama), asanas (yoga poses) and calming meditation. 1 in 5 Australians live with a mental illness such as anxiety, depression, anorexia, bipolar or schizophrenia. Many don't seek help because of the stigma associated with mental illness. The truth is that we can all do something to help shed a more positive light on mental illness and to support them in seeking help. On World Mental Health Day Wed 10 October 2018 we are encouraged to support those in your community that live with mental illness or know someone with a mental illness. Yogarama held a series of free yoga and mindful meditation classes to support help our community that may know someone or themselves have a mental illness. Our gentle yoga and meditation classes were led by two of our experienced Yogarama teachers that have recently joined the community - Simone Lai and Pats Kinnaird. Enormous gratitude to both teachers for taking the classes in the pouring rain. It was pretty wet weather and still the staff from Black Dog Institute joined in the class to show their support for the cause. For the second time, Yogarama chose to raise funds for Black Dog Institute's research into mental wellness. Our first fundraiser for the Black Dog Institute was on a yoga weekend in July 2018 and raised over $500. We met one of the researchers at the Black Dog Institute that is undertaking research into mindfulness and we hope to be working together to create a Mindful Meditation Course just for the Yogarama community. Please email yoga@yogarama.net if you are interested in our 4 week Mindful Meditation course. Practicing yoga can bring us more in tune with our own cycles as well as the cycles of nature. Humans are approximately 60% water and we are energetically affected by the phases of the moon. The moon is exerts two and a half times the gravitational pull of the sun. Many of us feel this powerful effect without realising it. 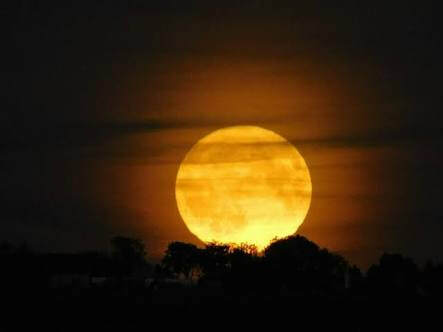 The full moon has a strong energy and is a time of fullness, completion, endings, and letting go. Energetically the Full moon is a powerful time in the lunar cycle when the moon pours down a tremendous amount of energy. Our body responds to this and whatever is going on in your body and mind, is amplified. If you are angry, you will feel angrier or if you are happy, you will feel happier. This is a good time for spiritual practice to help you attain a calm state of mind so you can use the lunar energy for transformation. Yogis and other spiritual practitioners throughout the ages have performed rituals during the Full moon to channel the powerful lunar energy to the higher chakras, so that it provides the opportunity to transform, empower, heal and cleanse. By bringing awareness to those things that are blocking us and holding us back we are able to work on letting them go so we no longer feel as stuck. We can use the two week period of the waning moon (becoming smaller) to continue to let go and affirm our willingness to release any obstacles to happiness. The new moon brings with it the opportunity for new beginnings and new directions. We can use the new moon energy to identify what it is that we truly want in our life and start to plant the seeds of growth. During the two weeks of the waxing moon (growing larger) we continue to add energy to the intentions and goals we have set, and take any action that we can to help make our dreams a reality. The Full Moon then arrives once again, which gives us the opportunity to let go of anything which may be standing in the way of manifesting our goals and dreams – and so the cycle starts again! If you ever found that you can’t sleep for a few nights in a row or feel overly emotional, exhausted or filled with the need to make big changes and start something completely new for no apparent reason? Step outside at night and check out the size of the moon. You may be tuning into the energetic cycles of the moon. Yogarama classes tune into the moon cycle and each week we explore a different aspect of yoga so that at the end of each month we are energetically balanced and in tune, bringing you into optimal health. If you are interested in how the moon cycles influence our yoga sequence - email: daniella@yogarama.net. More than 5000 years ago yoga & Ayurveda started its journey in ancient India as the science of exercise and healing, passed along from teacher to students through physical practice. 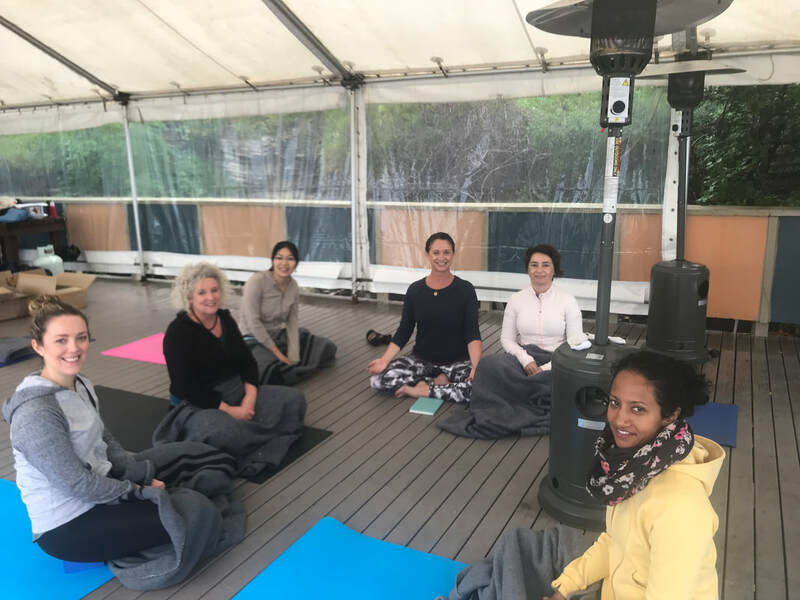 Travel about 5000 miles and 5000 years later across the Indian ocean to Coogee’s Wylie’s Baths and you will see a dedicated group of yoga students every morning practising yoga in the open air studio in a class on the northern deck guided by one of the inspirational local yoga instructors. Wylie’s Baths in Coogee is open all year – 365 days and yoga is also offered through all four seasons. This month, Wylie’s Winter Wellness space is being upgraded, with an enclosed marquee for winter encouraging yogis to practice all year around in the fresh air surrounded by sea & nature. 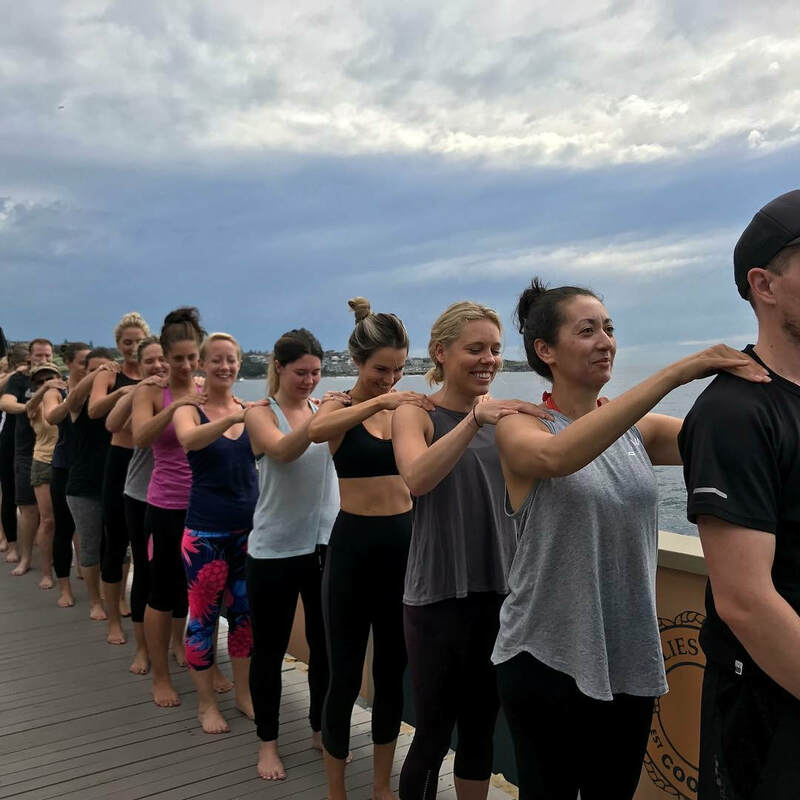 If you have not experienced yoga at Wylie’s Baths in Coogee, here are 5 top reasons you should try it. 2. Enjoy spectacular views practising yoga. Gazing out to the sunrise or sunset over the ocean and stretch up to view blue sky balancing in tree pose. 3. Experience the unique benefits of breathing in the fresh sea air to purify your lungs and pranyama (breathing) that are energizing and grounding. 4. 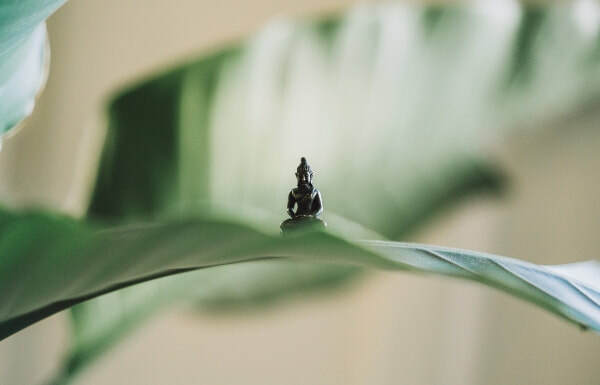 Guided meditation at the beginning of each class, encourages yogis to leave behind their busy schedule and quieten their minds as they are guided to connect to the peaceful calmness of Wylie’s. For the first time in 2018, Wylie’s Winter Wellness Day Retreats are being offered - it is a truly replenishing and healing full day at Wylie’s. The day spa includes a 1.5 hour uplifting yoga practice and grounding mindful meditation. A fresh light morning tea and wellness talk followed by a delicious wholesome warm Ayurveda lunch and self-care talk by our local Ayurveda chefs. A heavenly one-hour massage by the sea awaits those that chose to book in. A restorative yoga practice and yoga nidra completes the wellness day as each participant is gifted a wellness goodies bag supported by local businesses. Forget travelling out of Sydney for a wellness retreat, join us in the heart of Sydney. Autumn is the season of transformation. We can see this all around us in nature: the leaves start to fall, the air is changing - now cool and windy and an entirely new crop of fruits and vegetables are being harvested. It is important that we change with the seasons — just as nature does. It is the time to adapt our yoga practice, daily habits and food choices. Whilst we can feel the crisp, sharp, aliveness of the Autumn air, its an ideal time to master your breathing exercises (pranyama). Clear a space in your day to try out a regular breathing exercise. Wake up half an hour earlier to begin your day with breathing exercises such as Nadi shodana (alternate nostril breathing), helping to purify the energy channels that block from tension and constriction of the channels.We'll be practising breathing exercise in our morning yoga classes & on retreat. As you start to tune into your breath you'll begin quietening your mind and letting go of what is not serving you. If you don't have time early morning, consider hopping off the bus a few stops early and simply clear out the lungs by taking a walk with awareness or taking a swim in Wylie's Baths ocean pool after class- it's still warm. Let your feet do the walking, your arms & legs do the swimming & allow your breath to become the focus. 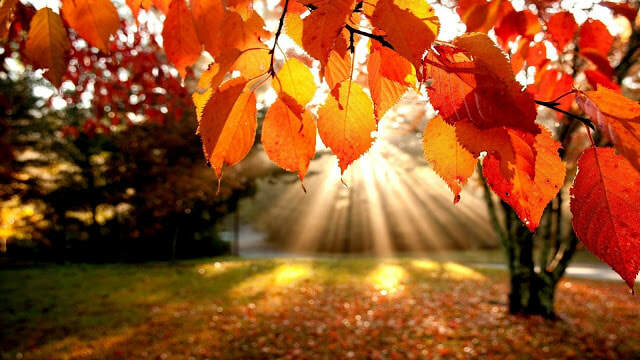 Give a little care to your digestive system as it is easily unsettled during Autumn season. The cooler air can agitate the digestive fire. According to the 5000-year tradition of Ayurveda medicine, in Autumn, your meals should be cooked and ideally served warm, including your breakfast. Keep the following to a minimum – processed or fried foods, ‘windy’ beans and vegetables, cold, raw or dry food, such as cereals and crackers. Focus on sweet, sour and salty foods and reduce bitter, astringent and pungent tastes. We are excited to introduce this Autumn, Wylie's Wellness one-day yoga & wellness retreats. Gift yourself a well-deserved time out from work and family commitments to relax and rejuvenate in the heart of Sydney surrounded by nature - our first series of one-day retreats is coming up soon, 5th and 8th April 2018. ​Our weekend retreat in the bush 50 mins from Sydney (Autumn and Spring) is almost full so book in or register your interest for our India yoga tours & retreats in November 2018. As 2018 is here, we've all made it through the silly season and hopefully set our intention for the new year. 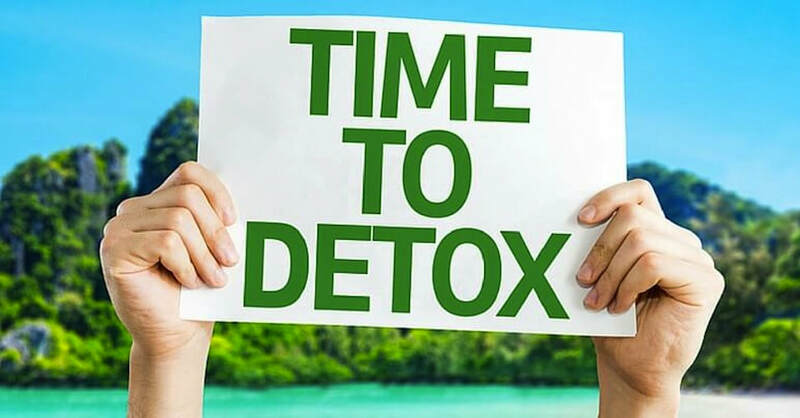 Now its time to detox! Thought it would be helpful to share my ten detox tips to set you up for a healthy start to the year! Drinking water is one of THE most important things for you to remember! Being DEhydrated can make you feel tired, sluggish and hungry for food your body doesn't need. Make sure the first thing you do when you wake up is to drink at least a glass of water at room temperature. Our bodies are made up of over 60% water. So drink H2O regularly and feel the difference! The easiest and cheapest method available to centre us during a busy period is already within us... our breath. Take a few moments throughout each day to breathe deeply, consciously and all the way down into your belly. This will help to relax your body and calm your mind, so you'll be able to process requests, invitations and information better. This will enable you to make good decisions about what you eat and what you can do to help you to detox. SO B R E A T H E! Try to aim to get plenty of fruits and vegies into your day. With summer upon us there are so many great fruits to indulge in. Aim to eat as much colour in your diet everyday, think all the colours of the rainbow. No, that’s not skittles! Whilst your detoxing, it’s great to eat cooling foods such as are leafy greens, coconut, cucumber, blueberries, pineapple and watermelon. Reduce dairy products and increase salads and other dishes with cooling parsley, and alfalfa sprouts. Avoid spicy food, alcohol, caffeine, and chilies. Peppermint or green iced tea are cooling. Alcohol, sugar, processed foods and stress of the silly season can greatly affect your digestive flora and result in bloating, poor bowel health and general sluggishness. Get a good quality probiotic supplement that provides a range of different strains and take daily to assist with building your good gut bacteria. Be grateful for what you already have, and then you will realise that you already have plenty. See the beauty in small things. Simple days add up to a very rich life. Rather than lament what you don’t have be thankful for what you do have. Live in the moment and be grateful for the gift of life. What we mean here is, look after yourself! Make sure you're nourishing your body with whatever you put in. Enjoy finding ways to add extra health and energy into your food. A good drink for first thing in the morning is hot water with lemon, ginger, turmeric and cayjenne pepper. The lemon will help balance the acidity in your body and the ginger is great for soothing sore tummies whilst turmeric is great for your joints and the pepper helps to absorb. You can add Apple Cider Vinegar in here for an extra kick if you fancy it! Finally, help your body process everything by eating slowly and being mindful of every mouthful. Chew your food! Burning the candle at both ends and not getting enough sleep is one of the fastest ways to drag your health down. Getting adequate sleep is a key part of a healthy lifestyle. Apart from having more energy to keep up a hectic schedule, your mood will be lifted, you’ll reduce stress, your body will repair and replenish itself, your mind will feel clearer plus you’ll feel and look refreshed. All definite bonuses! As tempting as it is to watch your new favourite show on Netflix over the holidays or take too many long lunches & dinners with friend or family, it’s vital that you maintain your daily exercise regime. Schedule your gym exercise in your calendar and better still, integrate movement into your social activities as best you can. Take a walk instead of a drive or picnic on the beach or, take a road trip and stroll through a town you’ve never been to. Get out into the fresh air, swim in the ocean, anything you enjoy. Before you know it, you will begin feeling healthier. There are so many ways to keep moving during the holidays, and your body will thank you for it. Set your intention to commit to the yoga and meditation habit in the new year as it is one of the best ways to help you detox after the silly season. Join Yogarama on the mat for a regular yoga practice and book into one of our yoga and mindfulness retreats so you can look forward to a rejuvenating yoga and meditation weekend as the years starts to get busier with commitment and stresses. Also, there are plenty of good meditation/mindful apps you can download to help you including: Calm, Smiling Minds and Headspace. Why not try using essential oils for a wonderful calming experience - add lavender oil to your bath salts or to your massage oil or you can diffuse the lavender so your room or entire home smells like a day spa. Lemon and peppermint are both essential oils that can be especially invigorating and detoxing. lemon is great for detoxing and regenerating whilst peppermint is an ancient remedy for indigestion and cleansing gut issues. There are so many more oils that can boost your health and wellness (ask me if you're interested). "So Here I am... In Incredible India. " ​"India is Calling". Increasingly this mantra hypnotised me on the journey to becoming a committed yoga teacher not yet in India but still at Coogee Wylies Baths (WB). As a yoga teacher, I chose to teach exclusively at WB, preferring it's spacious beauty & serenity for my growing following as an emerging yogi . The outdoor experience of connecting to nature whilst practicing yoga brings a calm balance back into ones body mind and spirit. A rejuvenating swim in the cool ocean of Wylies pool is always an added bonus on offer for my yoga students. Teaching yoga at WB has unfolded from being a dream, to become my reality once I discovered that working part time in the corporate world enabled me to make ends meet. The truth is though yoga teaching can be a lonely journey, and I began to feel lost and uninspired after three years of it. Increasingly I have felt the need to connect with other women to gain a deeper understanding of what they wanted from their yoga practice. Also, I became aware that what I needed was a mentor or in Indian culture terms a “swami” to guide me deeper through my personal yoga practice & into my yoga teaching. Yogic wisdom teaches that when you let the universe know what you want, it will speak back to you. 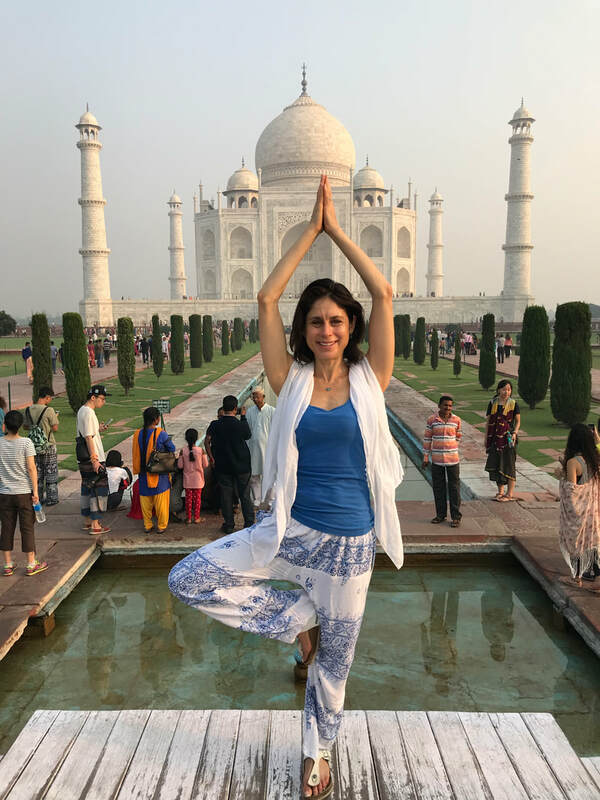 Within 6 months, I had run two local yoga retreats at an Indian style Ashram an hour outside of Sydney and my yoga student Sheryl Simantov, invited me to lead her yoga tour to India. I was thrilled & accepted! 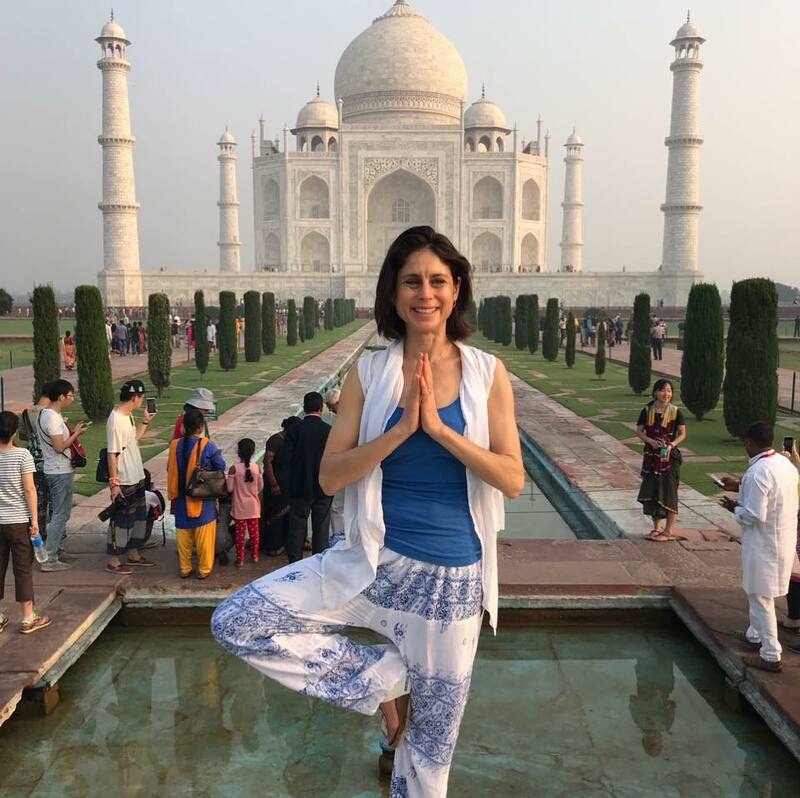 This shared retreat experience and my connection with Sheryl inspired a more courageous journey with a circle of women who shared the same yearning to experience India. So here I am, on this first of many more adventures to India ..this time with 9 wonderful women committed to 9 days of fun and deeper understanding of self through the experience of yoga beyond the stunning beauty of Wylie's Coogee to the overwhelming depth and challenge of yoga all around “incredible India “! Follow me on this amazing journey to India and join me, and dare to gift yourself this indulgent trip to India in November 2018. You will be a better woman for it!!! Daniella Goldberg has a love of yoga and a passion for mindful meditation. Through her Hatha-Flow classes, she gently guides her students to grow strong, be flexible, focused and mindful, on and off the mat.